There are few cities in the world that have as much music heritage flowing so visibly through their veins as New Orleans. It is a city that has birthed music genres, given the best musicians their start, and has quality music spilling out of every bar and on many street corners. A visit to NOLA can be overwhelming for anyone, and for the music fanatic there is simply too much to take in. Making the most of your trip might seem like a gargantuan task – how do you make sure you see the best bands, visit the best record stores and come away feeling like you haven’t missed a thing? You will have missed LOADS regardless. But let this guide to the crescent city give you a fighting chance. Music in New Orleans is best witnessed live! Walking around the French Quarter you’ll hear insanely good blues, jazz, funk and rock (and everything in between) oozing from every other bar. You can of course just play it by ear – you’ll accidentally have a great trip live music-wise, but it is worth having a bit of a plan. Bourbon Street is the most famous hub of activity, but it is best avoided for the real New Orleans experience. It is a heaving, theme park approximation of NOLA packed with cheap drinks, cover bands and strip clubs. It is the US equivalent of Magaluf. It is worth a visit and if this is the kind of vibe that sounds right for you, it is one of the best party streets in the world! But be warned that the whole street stinks of vomit. For a more authentic vibe head to the edge of the French Quarter to Frenchmen Street, which is packed with jazz clubs and other live music venues. Most of these bars are free entry, although you should expect to tip the bands after they play. For jazz head to the Spotted Cat and for a very intimate blues performance head to Apple Barrel. d.b.a offers bigger gigs for a small entry fee; on our visit we saw the incredible Hot 8 Brass Band for $10, which was more than worth the cash. If you are looking for a real live music institution make a trip to Tipitinas, a venue started in 1977 to give NOLA legend Professor Longhair somewhere to play in his later years. The gig posters adorning the walls are a testament to the incredible line-ups the venue has seen over the years, and most weeks top acts will be playing. The venue also runs a Free Fridays series, which gives you the chance to witness incredible live local music in this iconic venue. To get there, jump on the historic St Charles Streetcar (85p a ticket) to the Garden District. Hop off after 20 minutes at Washington Avenue. It is a 10-15 minute walk from there. 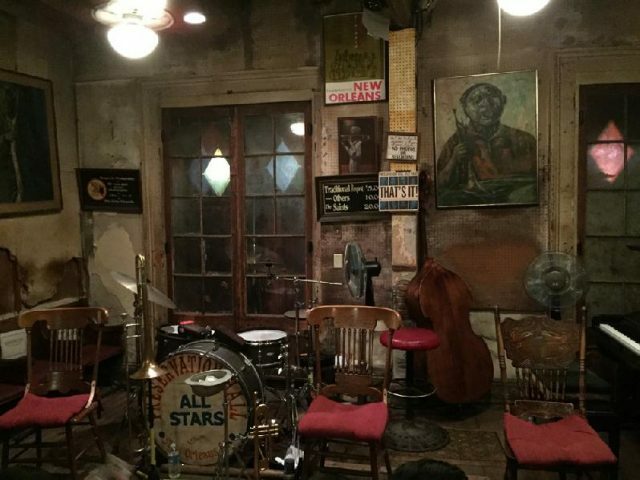 Another NOLA institution to visit is Preservation Hall, highlighted brilliantly in Dave Grohl’s Sonic Highways documentary, and the perfect place to get a real feel for old-time New Orleans jazz. You can queue up or reserve a seat for between $40-$50, which seems pricey but it is worth it for a guaranteed spot, and to avoid the hustle and bustle of the standing spaces – it can get intimate and crowded. But then again that is part of the charm. It is worth downloading the brilliant Livewire app from local radio station WWOZ. It is an interactive map that tells you what live music is happening each day (and night) in NOLA. 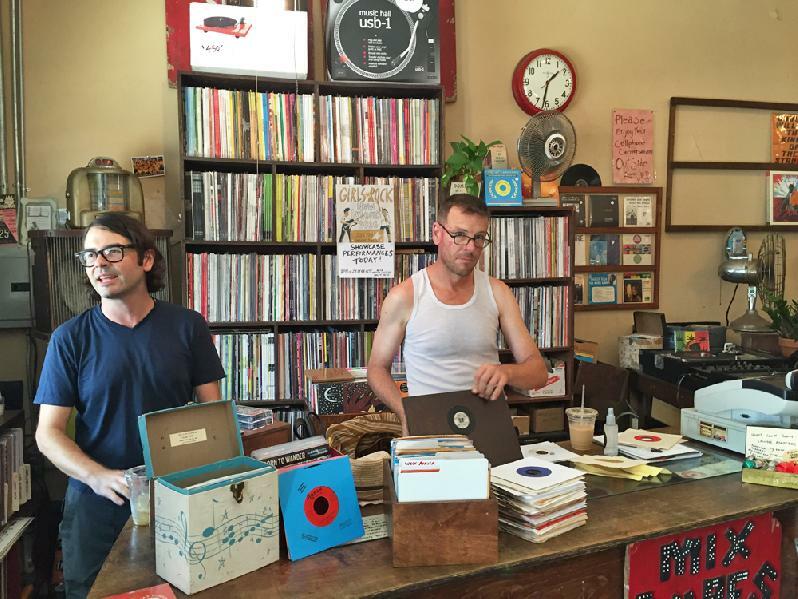 During my stay, I was lucky to be given a tour of some of the record stores by WWOZ Director of Music Scott Borne, which helped me uncover some of the true gems for record buying away from the French Quarter. Out of the centre a little way on Chartres St in the Bywater area, Euclid Records is a record collector’s Nirvana, whether you want CD or vinyl (it is particularly good for vinyl). Set over two floors it has a massive array of new and old titles, plus thousands of collectibles at a not unreasonable price. The second floor in particular is a treasure trove of 45 singles organised by record label and genre type. I was told the story of DJ Shadow and Cut Chemist spending two full days going through the shops selection – it is that extensive!! Domino Sound Record Shack, on Bayou Road, is a smaller cash-only store that is packed with interesting releases from across the globe. 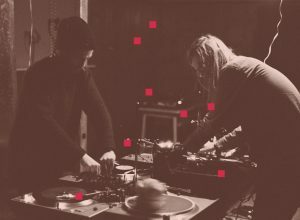 They also run a record label that collects interesting international music such as their compilation of Ethiopian Wedding Songs. 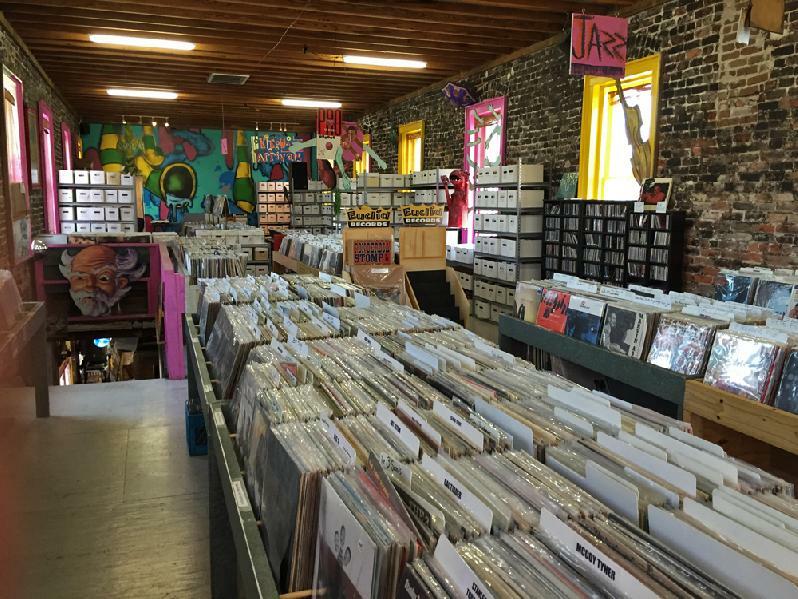 At the bottom of Frenchmen Street Louisiana Music Factory is a large store full of new and used vinyl and CDs, with a particular focus on the music coming out of Louisiana. The knowledgeable staff can help guide you to some gems from the city. They also hold many free concerts from great local acts, so it is worth checking out what they have in advance. It is also worth heading out to Magazine Street in the Garden District, which is packed with thrift and antique stores full of vinyl, antiques and other strange collectibles as well as vintage clothing. From the centre you can get there on the street car in 20 minutes. Drinking is a real culture in NOLA. Around the French Quarter you can buy a drink in one bar and walk with it to the next, opening up night and making it free and easy. This is especially great on Frenchmen Street, where you can hop from one place to the next to sample the best sounds (and booze). You should definitely indulge in some of the local cocktail classics like The Hurricane and The Sazerac, which were both invented in the city. Most of the bars you’ll walk into will have their own vibe and will be great, but I found myself in Molly’s At The Market, just of the market, several times which had a ‘locals’ vibe and incredibly friendly staff and clientele. One drinking activity you must do is visit the Carousel Bar at Hotel Monteleone which has a revolving bar that has been there for 65 years. If you can get a seat at the bar you’re in for a treat as you get the pleasure of slowly moving round the room as you drink. As everyone is in the same novelty place it opens up conversation. I was personally in there for two hours and got in several very interesting conversations with locals and tourists. NOLA is renowned for quality food, and you’ll not struggle to find good food at every budget. 90% of bars you walk into have decent food. If you are looking for something a bit more fancy you could do worse than heading to these establishments. Sitting on Magazine Street, Shaya really is something special. Now ‘Israeli tapas’ might not be top of your culinary wish list, but this is James Beard Award-winning chef Alon Shaya’s take on his native cuisine – obviously it is sublime. Dishes change regularly as food is sourced locally and you can grab three dishes for $15 or five for $23, and at dinner. It was so full when I went I had to find space at the bar, but this shouldn’t put you off – the friendly atmosphere made up for that and the food was mind-blowing. Shaya worked well as a dinner stop-off before heading to Tipitinas, which is a ten-minute walk away, for some live music. Nestled in the French Quarter I also dined at quaint restaurant Angeline, which adds a Northern Mediterranean edge to traditional southern cooking. It is a little on the pricey side at around $25 -$35 dollars for a main course, but the steak and peach dish I had was worth every penny. You should also head to French Quarter institution Antoines to sample Chicken Creole and Oysters Rockefeller at the restaurant they were invented. The restaurant is credited with shaping the city’s wonderful cuisine. For a real insight ask your waiter to give you a tour of the building’s 175-year history, including the concealed doorway in the ladies loo that lead to a tiny drinking den during the Prohibition era, and secret rooms belonging to Mardi Gras ‘crews’. 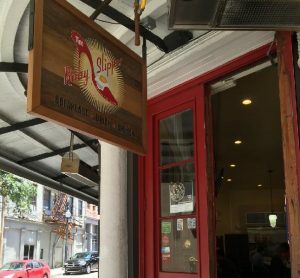 Brunch is a thing that NOLA inhabitants take seriously, and I would recommend any of the Eggs Benedict dishes at one of the two The Ruby Slipper restaurants as a safe bet. To tie some music in with brunch check out the world-famous Gospel Brunch at House of Blues which happens every Sunday at 10am. Listen to the best local talent whilst sampling the amazing food. It is worth every penny of $23 ticket price. Obviously jazz flows through the veins of New Orleans and you can get a glimpse at its history at The New Orleans Jazz Museum at the Old U.S Mint. It’s a great way to discover the music form in the city it was born in. Currently, in collaboration with the Louis Armstrong House Museum in New York, the U.S. Mint museum has an awesome, if small, exhibition on the early life of one of NOLA’s most famous sons – Louis Armstrong (or Satchmo as he was nicknamed). Away from music, if history is your thing, head to the National WWII Museum on Magazine Street. The pale-grey buildings don’t look like much from the outside, but inside the museum takes you on an interactive and informative journey through the conflicts in Europe and the Pacific, including rare photos and artifacts. In telling both sides of the story equally, it is extremely balanced in its telling in events. For a little extra cash you can have an interactive submarine experience or witness a 4D film voiced by Tom Hanks. Its American Sector bar plays 1940s tunes and has half-priced drinks from 4pm-7pm. If you meet a friendly enough local, like I had the pleasure of doing, that will drive you out to the Ninth Ward – the are most devastated by Hurricane Katrina – it is worth the visit, if a little morbid. The once vibrant area is still a ghost-town ten years on, with vacant lots where houses once stood in this devastated community. At several points you can still see the crosses that showed the number of dead scrawled in the doors of abandoned houses. It is a sobering reminder of one of the worst events in recent history. 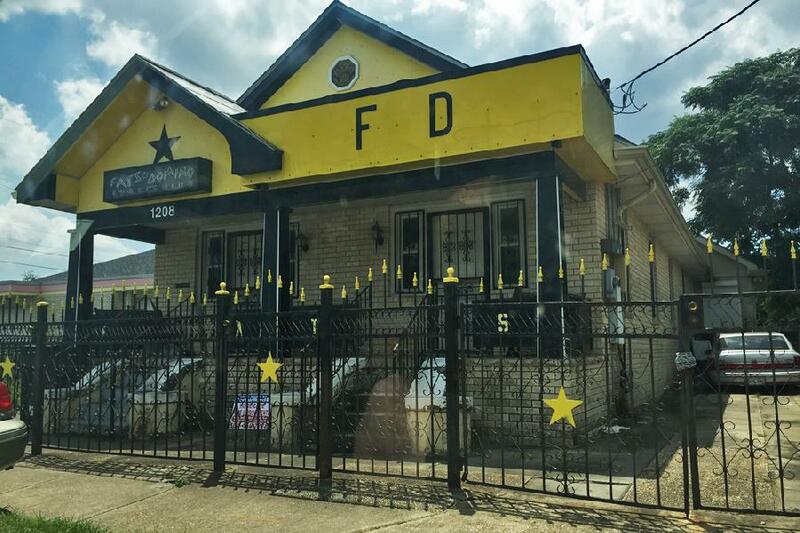 While in the area, swing by the ostentatious house of music legend Fats Domino – you can’t miss it. 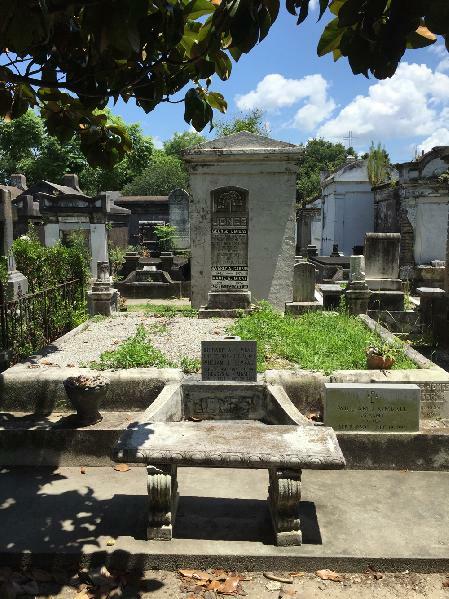 Also make a point of visiting Lafayette Cemetery, to witness one of the city’s famous and unique above ground mausoleums. This can be reached with a street-car ride to Washington Avenue and a short walk. Soundtrack your stay with the sounds from local heritage radio station WWOZ – grab the app on your iPhone and enjoy! This is by no means a complete guide to getting the most out of New Orleans, as there is so much to explore for any music fan – but use this list as a starting point for your adventures in NOLA.